This gift can be collected from the studio or emailed as a pdf. INVITE + take home pottery painting ceramic figure kit. Kit includes, ceramic animal 7cms, mini paint pots & paint brush. This gift can be collected from the studio or please add 5 euro for postage to your home. Limited edition Vibrant ceramic leaf inset in frame with a beautiful written quote. Gorgeous addition to any home. Includes 1 place at a 2.5hr workshop to upcycle a piece of furniture. Hot drinks & scones provided. This gift can be collected from the studio or emailed as a pdf . Antique lace serving platter handmade in studio in a choice of colours. 2 hands or feet imprinted into wet clay that is fired, painted in a colour of choice and choice of frame. This gift can be collected from the studio, emailed as a pdf or please add 2 euro for postage to your home. Includes: 1 place at a group workshop, try your hand on the wheel with Potter Holly Parrow and handbuild items with Laura. Lunch included. Includes: 1 place at a group pottery workshop, try your hand on the wheel with Potter Holly Parrow and handbuild items with Laura. Then relax with our Yoga class in the afternoon. Lunch included. Includes: Custom frame to fit up to 6 family imprints. 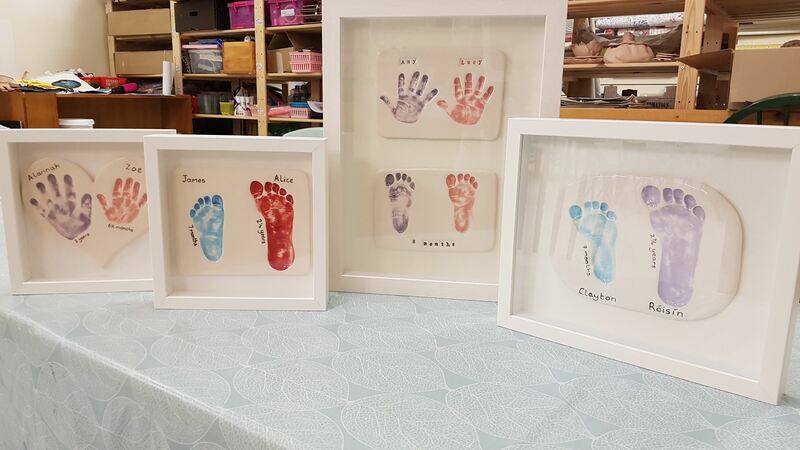 6 individual imprints of hands or feet are taken in wet clay and fired, then painted in a colour of your choice and added to custom made wall hanging frame. Includes: Pottery painting a mug or planter for the office for 10 adults plus light lunch. Includes: Pottery painting or clay hand building for 8 adults plus Prosecco & Pizza. 7-10pm 3hrs. Includes: private pottery workshop, try your hand on the wheel with Potter Holly Parrow and handbuild items with Laura. Then relax with our Yoga class in the afternoon. Lunch included. Private Pottery Painting & Yoga alternative also.